Featuring 15 Homemade Gift Craft Lessons. Full-Color Photo Directions, Step-by-Step Instructions, & Supply Lists. Now you can create your own simple, heARTfelt gifts at home (or in your classroom!) 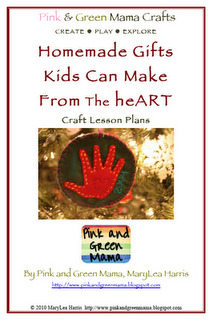 with my latest eBook, "Homemade Gifts Kids Can Make From The heART"
15 Complete Projects in a 53-page PDF Formatted Craft e-Book for only $10.00!